You may or may not have noticed but this space, namely the ‘Review’ section of the website, has been stone cold for a number of weeks. This is because Wolfgang and I have been conversing behind closed doors and have finally got things ready to go, with a steady action plan for the future. I will be posting a new record reviews as well as write ups of any Adelaide music events I attend for your reading pleasure. There is also talk of expanding this section of the website to include cool music news and interviews with local adelaide bands – as well as dates for the hottest upcoming local gigs! So keep your eyes peeled on this space as we’ll have a write up of Tool’s Entertainment Centre show in the next couple of days; and for now enjoy my account of Adelaide’s Scorcherfest. 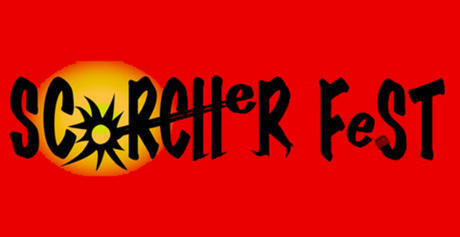 “I went to Scorcherfest on Saturday the 6th of April to check out a couple of my friends’ bands. The festival is constructed of mostly local bands with a few shipping in from interstate. The atmosphere there is excellent, and muse-o’s were abundant, approachable, and around every corner. The venue feels like an old school party, with 3 stages spread across the two floors at Live on Light Square, leaving ticketholders freedom to intermingle between different sets and a great variety of musical styles. First up on the acoustic stage was singer Jake Heading. He played a set of cover songs but adapted them to his individual vocal style. And man this kid can sing! Loveable as well as accessible, keep an eye on Jack Heading because someone will definitely snap him up and make him a star in the coming years if he doesn’t do so himself. A bit later on I caught Fell at 10, who sound like System of a Down; not only due to their interesting breakdowns and riffs but the sheer vocal talent between the two front men Jake Daulby and Timmy Raspe. I approached Jake after the set and we smoked a cigar together while chatting about music – that’s the kind of jam Scorcherfest is. I cruised down stairs to see Tomorrow Rising. They have great potential, but seemed encumbered by five members. Vocalist Callum Parr is talented, yet appeared to only emulate Billy Joe Armstrong in his style. With ingenuity they could have some stellar sounding vocal styles upon what is an already solid foundation. The true star of the show was on lead guitar – Steff Esposito. Although you wouldn’t know it, because he slinks off in the corner of the stage, even sitting down cross legged to shred out a guitar solo, but man he’s got chops, fingers shooting across the fret to create interesting and diverse leads to their songs. Before heading up to the main stage a band called Kill the Fungus played post Tomorrow Rising, and they were my kind of band. Think like Tenacious D had a baby with Mastodon and that baby grew up listening to Rage Against the Machine. Bodacious front man Zipeto (This is a two piece band by the way) thrashed away at the drums while singing at the same time, and guitarist Shellbot Hooper laid down some fuzzy progressive riffs over the top. It was a very full on and entertaining set, though something was entirely missing in the way of a bass player – I’m sure they’ll find one soon. The highlight of the night was most assuredly Slick Arnold, and I’m telling you right now that they are the best band this side of anything. When front man/lead guitarist Jack Crawford introduced me to the other two members of his band Mitchell on bass and Peter on drums I could not have anticipated the sheer talent behind the men. Now holy Mary mother of God these three are all musical prodigies to the utmost extent of meaning the word prodigy upholds. I was so in awe of their tunes the entire way through the set that I can’t even give a proper and articulate opinion of what their sound is like. If there is a band that I think will make it big it’s this one. Go buy their EP or something.